The building was designed by a local architect, Matthew Henry Holding (1846-1910) in 13th century Gothic style. It was the gift of the Phipps family in memory of Pickering Phipps, a local brewer who had twice been Mayor of Northampton and twice an MP. The foundation stone was laid on St Matthew's Day in 1891 and the church was dedicated in 1893 on St Matthew's Day, 21 September. 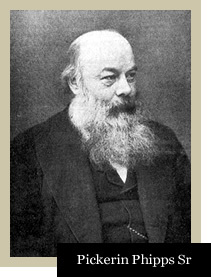 In 1868, the Dean of Cork, William Connor Magee, approached the Prime Minister, Disraeli, with the request that he might be considered for any appointment in the Church of England made vacant through the appointment of a new Dean of St Paul's. The reply turned down the request but on the reverse sheet offered the Irishman the See of Peterborough. The new Bishop, already famous as an orator, flung himself into his work as a diocesan, determined to show energy and zeal. One of his aims was to claim back Northampton, then rapidly growing, for the established church. Since the Reformation when shoemakers were in the vanguard of Protestant extremism, Northampton had been strongly non-conformist. In the nineteenth century the town showed its radical independent temper by electing an atheist, Charles Bradlaugh, as MP. Bishop Magee was determined to reverse these dangerous tendencies. He created a Church Extension Committee for Northampton made up of staunch Anglican gentlemen and businessmen, to raise funds for new churches in the town. He also recruited widely, zealous young priests, firm on church principles, to staff his new infant parishes. It was thus that a young priest of Tractarian views was selected in 1889 to begin a mission in the Kingsley Park area, then in the parish of Kingsthorpe. The Reverend J R Hussey, who was then Curate of Belgrave in Leicester, began his work in Northampton in the Junior Schoolroom in Byron Street. By Easter an iron church had been erected, dedicated to St Matthew, which housed 72 communicants at its first Easter Day services. In 1890 the situation of the new congregation was dramatically changed. When Pickering Phipps died, he had already indicated that he would give land for the erection of a church and vicarage in Phippsville, the new estate then laid out to match the existing Kingsley Park housing in the poet streets. His four daughters and only son decided to carry out their father's wishes, and to erect a great church in his memory. Mr Matthew Holding, architect of the iron church, was selected to design it. Various relatives of the Phipps family agreed to furnish the building. The foundation stone was laid on St Matthew's Day 1891, but not by Bishop Magee, who had recently been rewarded for his efforts in Peterborough by being made Archbishop of York. Sadly he was only to enjoy his elevation for two months, since he died of influenza in his sixty-fourth year. It was therefore his learned successor, Bishop Mandell Creighton, who laid the foundation stone, and returned to consecrate the almost completed building on St Matthew's Day 1893 and to institute Fr Hussey as first Vicar. Most of the fittings which can now be seen - pulpit, iron screens and organ, followed in 1895. The clock and bells were installed in 1897-98. By the turn of the century the building was substantially the same in appearance as it is today. St Matthew's enjoyed all the activities then thought to indicate a vigorous church life. The introduction of incense in 1927 and reservation of the Sacrament from 1930 placed St Matthew's firmly in the mainstream of Anglo Catholic churchmanship. of St Matthew's as great as any made by its founding pastor. As a curate in Kensington he had got to know as personal friends many who already were, or were to become, leading figures in the world of literature and the arts. Fr Hussey was driven by the desire to build a bridge between the church and modern artists through adventurous commissions. When he came to St Matthew's, albeit reluctantly, he was determined to turn his convictions into action. Though the liturgy and life of the parish remained largely unchanged from his father's day, he proceeded throughout the thirteen years of his incumbency to commission for St Matthew's, often at extraordinarily low cost, an outstanding succession of fine works of art. Moore's sculpture and Sutherland's painting are the tangible evidences of this in the church, but musical works by Britten (Rejoice in the Lamb), Rubbra, Finzi and Howells were also obtained, and literary commissions by Auden and Norman Nicholson were undertaken. Canon Walter Hussey's pre-eminence in this field of the church and the arts was recognised by his appointment in 1950 to the Deanery of Chichester where he was to continue his pioneering work. 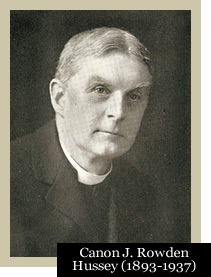 His successor, Father Charles Mackenzie OBE came to St Matthew's from Dulwich, with a reputation as an evangelist, preacher and skilled parish priest. He seems to have felt that St Matthew's needed urging forward into the mainstream of contemporary Catholic thinking and liturgy and sought to make the principal mass one at which all communicated. He again was in personality and manner starkly contrasted to his predecessor. His concern was overwhelmingly for the conversion of the parish. Sadly, his energetic ministry was brought to a sudden end when he died on holiday at the age of 47 in 1961. Fr Philip Turner came in 1962 from a charge in Crawley, and was in the event to be vicar for only four years. He threw himself into youth work, and obtained a nave altar for westward celebrations when the children of the church school attended. His own great talent and interest lay however in religious drama and some spectacular productions took place in the church during his brief incumbency. It was in fact his desire to write religious plays which helped to lead him to accept in 1966 a post in religious broadcasting. of St Paul's Cathedral. He secured the services of organists of the first rank, Stephen Cleobury and Michael Nicholas, both destined for Cathedral posts, and maintained the tradition of commissioning musical works by leading composers for the church. During his eight years' incumbency, the elderly and inadequate church room was replaced by the new parish centre which stands in the grounds. It remains a tremendous boon to the church's work. Fr Moxon left St Matthew's in 1975 to become Canon Precentor of Salisbury Cathedral, where he was to enjoy ten very happy years before his retirement, sadly terminated within months by death. The Reverend John Morton came to St Matthew's in 1975 from St Andrew's, West Kirby in the Wirrall. Quite soon after his arrival the Church School in Byron Street had to close because of the age and unsuitability of the buildings. Church work in Kingsley began in these and has suffered in the area since the link was broken between children and families and the church. and designed as a memorial to the ministry of Dean Hussey. 1993 saw the celebration of the centenary of the work begun by Rowden Hussey. at St Matthew’s and the development of a collaborative approach to ministry in line with contemporary insights. Under his guidance the PCC expanded the dais at the front of the nave and introduced a new altar and chairs. The Lady Chapel was also reordered, and plans were made for the rewiring and lighting of the church. 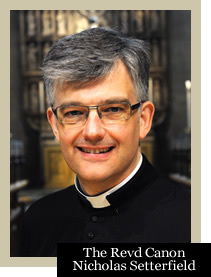 In 2002 Fr Tim left St Matthew’s to become Team Rector of Solihull, Birmingham. The present incumbent, the Reverend Nicholas Setterfield, became the eighth vicar of St Matthew’s in August 2003. He had formerly been Rector of Letchworth in the Diocese of St Albans. Under his tenure the renewal of the church's worship, ministry and mission is on-going, together with a concurrent renewal of the church building and its contents. A state of the art lighting scheme with touch screen control has been installed, greatly increasing the versatility of the environment afford by St Matthew’s for both worship and concert use. The liturgical arrangements at the front of the nave have been completed with the introduction of an ambo, concelebrants' chairs, and a credence table. Each is made of maple and walnut to match. The church's forced-air heating system has been renewed. Toilet and kitchen facilities at the base of the church tower completed in 2011. In 2009 the parish’s tradition of artistic patronage was renewed with the unveiling of a life-size bronze sculpture of St Matthew by Ian Rank-Broadley at the Patronal Festival. The sculpture is situated on the south side of the Quire Screen, and is widely considered a worthy addition to the church. 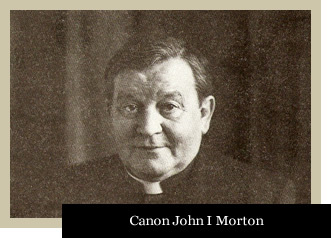 The commission was the result of a benefaction given for the purpose by Canon John Morton, who died in 2002. St Matthew’s Music has been created to help sustain the musical life of the parish for the long-term. Following a Fan the Flame Mission in 2008 there has been a renewed emphasis on the parish's Ministry of Welcome. This is borne of a widespread recognition and desire that we meet the contemporary needs and expectations of all who come to St Matthew’s for both sacred and secular purposes. In particular, plans are currently being formulated to establish a narthex, or antechamber, to the nave of the church. It is proposed that this be situated within the existing structure of the vault supporting the gallery at the west end. The proposal takes as a precedent the examples of such an antechamber found in early Christian churches for use by catechumens and penitents. There has been a fresh realization that part of our challenge in developing our Ministry of Welcome is linked to the existing physical arrangements at the west end of the church. These are far from ideal and, in a number of respects, conspire to act as an impediment to our ministry and mission. Whilst we wish to be respectful of the fine Victorian environment afforded by St Matthew’s, we nonetheless wish to make such changes to this part of the church as will facilitate Christian hospitality, welcome and nurture. These plans are to be published in due course. St Matthew's is a rather unusual parish church, a place where uncommon things are possible, and where the evolution of the church and locality has been inextricably intertwined. Whilst its worshippers take justifiable pride in the splendour of the building created as Pickering Phipps' memorial, and a living tradition where all is worthily done, they nonetheless recognize that the People of God exist to bring the Gospel to that wider community which grew up in the latter stages of the nineteenth century, where the tramlines once ended, and which is known throughout Northampton as Kingsley. This we seek to do in our own day, near the beginning of the twenty-first century with its own opportunities, challenges, and rewards.